Chelsea Clinton challenged Ivanka Trump on Tuesday to ask her father to detail how he would fight to guarantee equal pay for women, criticizing the Republican nominee for failing to provide explicit policy proposals on the issue. Clinton said during a Facebook Live interview with Glamour magazine Tuesday that unlike Donald Trump, her mother, Hillary Clinton, has repeatedly laid out a platform for voters outlining how she would accomplish policy goals in the White House. "Whether that’s on gun control or protecting a woman’s right to choose or any of the things we’ve talked about. She also tells you how she’s going to pay for it," Chelsea Clinton said. The Democratic nominee’s daughter condemned Donald Trump for not highlighting equal pay or accessibility to quality child care for all on his website. 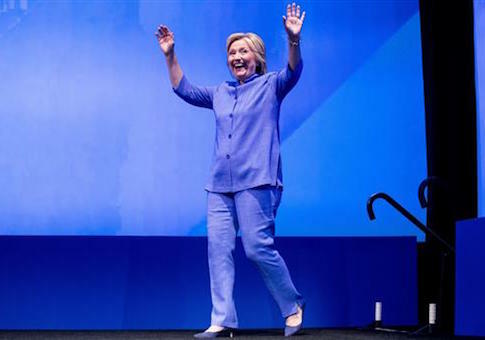 While Hillary Clinton has vowed on the campaign trail that she will pour energy into closing the gender wage gap should she win the White House in November, the former first lady stumbled over the issue during her time in the U.S. Senate. Women who worked for Clinton when she served in Congress were paid 72 cents for each dollar paid to men, according to a Washington Free Beacon analysis of salary data from her Senate years. From 2002 to 2008, the median income for a female staff member working in her office was about $15,708 less than the median salary for a man, the report found. Still, Clinton has regularly charged that Donald Trump is untrustworthy on women’s issues. Ivanka Trump vowed during the Republican National Convention last week that her dad would advocate for issues that would advance women in the workplace, telling the crowd that he would "fight for equal pay for equal work." While Trump has said throughout his campaign that he believes women should earn equal pay for doing the same job as men, he has not yet offered an explicit policy recommendation that would address the issue. This entry was posted in Politics and tagged Donald Trump, Hillary Clinton, War on Women, Women. Bookmark the permalink.